Get a feel for this usually secretive world during a once a month chance. The sublime skills and artistry of the geisha is now yours to see. Observe as the skilled entertainers perform a classic dance alongside traditional music, and discover the tremendous skill of the geisha. Geisha are also premier entertainers, both in cultural and informal ways. 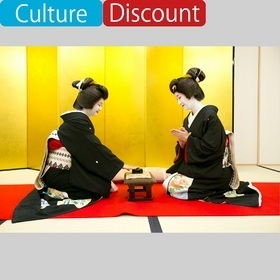 Join for some of the ozashiki drinking games, and find out for yourself what it is like to be a regular customer of the geisha.